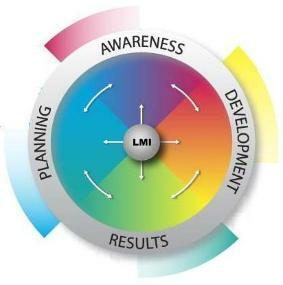 The LMI Strategic Development ProcessTM is unique in its ability to merge organizational strategic planning with organizational development - all in one consistent implementation model. This practical, common-sense model provides diverse services in a single, comprehensive process. LMI clients access one service for total planning and development resources. The process model is a balanced wheel with four quadrants: Awareness, Planning, Development, and Results Management. The wheel signifies a continuous process, one which can move in either direction and begin at any quadrant, based on client needs. The wheel signifies a philosophy that creates a driving force to unify all services that we perform. This ensures, for example, that a people development plan considers your strategy and vice versa and that an operating plan has clear accountability and follow through. Whether we provide services in all areas, or just one, our objective is to understand your business, establish clear objectives up-front and carefully track progress to ensure that we do what was promised and you are successful.